Rencana ini memerlukan kemaskini dalam Bahasa Melayu piawai Dewan Bahasa dan Pustaka. Sila membantu, bahan-bahan boleh didapati di Nîmes (Inggeris). Nîmes (/niːm/; Perancis: [nim]; Provençal Occitan: Nimes Templat:IPA-oc) adalah sebuah bandar yang terletak di wilayah Occitanie, selatan Perancis. Ia merupakan ibu negeri bagi jabatan Gard. Nîmes terletak di antara Laut Mediterranean dan pergunungan Cévennes. Penduduknya dianggarkan berjumlah 146,709 orang (2012). Nîmes kaya dengan sejarah, bermula sejak zaman empayar Rom apabila kota ini didiami oleh 50,000–60,000 penduduk. Beberapa monumen terkenal terdapat di Nîmes, seperti Arena Nîmes dan Maison Carrée. Oleh kerana ini, Nîmes sering kali dirujuk sebagai Rom Perancis. Nîmes mengalami cuaca mediterranean yang mana paling panas di Perancis. Kedudukannya yang agak ke darat, arah selatan membawa udara panas ke atas kota semasa musim panas, manakala semasa musim sejuk agak dingin. 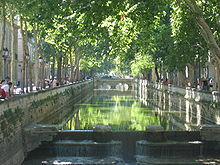 The city derives its name from that of a spring in the Roman village. The contemporary coat of arms of the city of Nîmes includes a crocodile chained to a palm tree with the inscription COL NEM, for Colonia Nemausus, meaning the "colony" or "settlement" of Nemausus, the local Celtic god of the Volcae Arecomici. Veterans of the Roman legions who had served Julius Caesar in his Nile campaigns, at the end of fifteen years of soldiering, were given plots of land to cultivate on the plain of Nîmes. The city was located on the Via Domitia, a Roman road constructed in 118 BC which connected Italy with Spain. Its name appears in inscriptions in Gaulish as dede matrebo Namausikabo = "he has given to the mothers of Nîmes" and "toutios Namausatis" = "citizen of Nîmes". The site on which the built-up area of Nîmes has become established in the course of centuries is part of the edge of the alluvial plain of the Vistrenque River which butts up against low hills: to the northeast, Mont Duplan; to the southwest, Montaury; to the west, Mt. Cavalier and the knoll of Canteduc. The Neolithic site of Serre Paradis reveals the presence of semi-nomadic cultivators in the period 4000 to 3500 BC on the future site of Nîmes. The population of the site increased during the thousand-year period of the Bronze Age. The menhir of Courbessac (or La Poudrière) stands in a field, near the airstrip. This limestone monolith of over two metres in height dates to about 2500 BC, and must be considered the oldest monument of Nîmes. Zaman Gangsa meninggalkan kesan-kesan perkampungan yang diperbuat daripada pondok-pondok dan dahan pokok. The Warrior of Grezan is considered to be the most ancient indigenous sculpture in southern Gaul. [petikan diperlukan] The hill named Mt. Cavalier was the site of the early oppidum, which gave birth to the city. During the third and 2nd centuries BC a surrounding wall was built, closed at the summit by a dry-stone tower, which was later incorporated into the masonry of the Tour Magne. The Wars of Gaul and the fall of Marseille (49 BC) allowed Nîmes to regain its autonomy under Rome. Nîmes became a Roman colony sometime before 28 BC, as witnessed by the earliest coins, which bear the abbreviation NEM. COL, "Colony of Nemausus". Some years later a sanctuary and other constructions connected with the fountain were raised on the site. Nîmes was already under Roman influence, though it was Augustus who made the city the capital of Narbonne province, and gave it all its glory. It was also known as the birthplace of the family of Roman Emperor Antoninus Pius. The city had an estimated population of 60,000 in the time of Augustus. [petikan diperlukan] Augustus gave the town a ring of ramparts six kilometres (3.7 batu) long, reinforced by fourteen towers; two gates remain today: the Porta Augusta and the Porte de France. An aqueduct was built to bring water from the hills to the north. 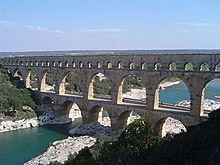 Where this crossed the River Gard between Uzes and Remoulins, the spectacular Pont du Gard was built. This is 20 kilometer (12 batu) north east of the city. Also, the Maison Carrée is one of the best preserved temples to be found anywhere in the territory of the former Roman Empire; it later inspired the design of the Virginia State Capitol at Richmond. Nothing remains of some other monuments, the existence of which is known from inscriptions or architectural fragments found in the course of excavations. It is known that the town had a civil basilica, a curia, a gymnasium and perhaps a circus. The amphitheatre dates from the end of the 2nd century AD and was one of the largest amphitheatres in the Empire. Emperor Constantine endowed the city with baths. It became the seat of the Diocesan Vicar, the chief administrative officer of southern Gaul. The town was prosperous until the end of the 3rd century – during the 4th and 5th centuries, the nearby town of Arles enjoyed more prosperity. In the early 5th century the Praetorian Prefecture was moved from Trier in northeast Gaul to Arles. The Visigoths finally captured the city from the Romans in 473 AD. Nemausus, Nismes Civitas Narbonensis surrounded by its walls, after Sebastian Münster (1569), 1572. After the Roman period, in the days of invasion and decadence, the Christian Church, already established in Gaul since the 1st century AD, appeared be the last refuge of classical civilization – it was remarkably organized and directed by a series of Gallo-Roman aristocrats. However, when the Visigoths were accepted in the Roman Empire, Nîmes was included in their territory (472), even after the Frankish victory at the Battle of Vouillé (507). The urban landscape went through transformation with the Goths, but much of the heritage of the Roman era remained largely intact. By 725, the Muslim Umayyads had conquered the whole Visigothic territory of Septimania including Nîmes. In 736-737, Charles Martel and his brother led an expedition to Septimania and Provence, and largely destroyed the city (in the hands of Umayyads allied with the local Gallo-Roman and Gothic nobility), including the amphitheatre, thereafter heading back north. The Muslim government came to an end in 752, when Pepin the Short captured the city. In 754, an uprising took place against the Carolingian king, but was put down and count Radulf, a Frank, appointed as master of the city. After the war events, Nîmes was now only a shadow of the opulent Roman city it once had been. The local authorities installed themselves in remains of the amphitheatre. Carolingian rule brought relative peace, but feudal times in the 12th century brought local troubles, which lasted until the days of St. Louis. During that period Nîmes was jointly administered by a lay power resident in the old amphitheatre, where lived the Viguier and the Knights of the Arena, and the religious power based in the Bishop's palace complex, around the cathedral, its chapter and the Bishop's house; meanwhile the city was represented by four Consuls, who sat in the Maison Carrée. Despite incessant feudal squabbling, Nîmes saw some progress both in commerce and industry as well as in stock-breeding and associated activities. After the last effort by Raymond VII of Toulouse, St. Louis managed to establish royal power in the region which became Languedoc. Nîmes thus entered finally into the hands of the King of France. Ruins at Nîmes, painting by Hubert Robert. Semasa kurun ke-14 dan 15, Lembah Rhone mengalami siri-siri serbuan berterusan yang menghancurkan ekonomi dan menyebabkan kebuluran. Adat resam dilupakan, kekacauan agama menyebabkan (lihat Perang Agama Perancis) dan epidemik, kesemuanya mejejaskan bandar ini. Nîmes, yang mana merupakan salah sebuah kubu kuat Protestant, menghadapi tekanan berskala penuh dan konfrontasi perang saudara (termasuk pembunuha beramai-ramai Michelade) yang mana berlanjutan sehingga pertengahan kurun ke-17, tambah sengsara berlakunya kejadian wabak. Les Quais de la Fontaine, tambak-tambak yang menyediakan air kepada kota ini, taman-taman sivik pertama di Perancis yang dibina pada tahun 1738–55. Pada pertengahan kurun ke-17, Nîmes menikmati satu zaman kemakmuran. Pertambahan penduduk menyebabkan kota dibesarkan, dan perumahan setinggan digantikan. Notre-Dame-Saint-Castor, istana Bishop dan pelbagai rumah agam (Hotel) telah dibina semula. Pembaharuan ini menguatkan industri pembuatan dan pekerjaan industri di kota ini, jumlah penduduk meningkat daripada 21,000 kepada 50,000 orang. Pada zaman ini juga dibina taman-taman pancur, Quais de la Fontaine telah dibina di kawasan sekeliling Maison Carrée dan Amphitheatre telah dibersihkan daripada pencerobohan, sementara keseluruhan penduduk mendapat manfaat daripada kemakmuran yang dinikmati. Berikutan dengan krisis ekonomi yang melanda teruk Nîmes, zaman Revolusi menghasilkan penyangak politik dan agama. Keganasan Putih ditambah dengan malapetaka semulajadi and kemelesetan ekonomi, menyebabkan pembunuhan, penjarahan dan pembakaran dengan senjaga berlarutan sehingga tahun 1815. Undang-undang kemudian berjaya dikuatkuasakan dan Nîmes menjadi sebuah kota metropolis bagi Bas-Languedoc, mempelbagaikan industrinya. Pada masa yang sama, kawasan sekitarnya mengadaptasi keperluan pasaran dan berkongsi peningkatan kekayaan. Semasa Perang Dunia II, pejuang penentang Maquis, Jean Robert dan Vinicio Faïta dihukum bunuh di Nîmes pada 22 April 1943. Perkarangan Nîmes pula dibom oleh pesawat pengebom Amerika pada tahun 1944. 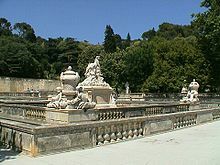 The Jardins de la Fontaine. The elliptical Roman amphitheatre, of the 1st or 2nd century AD, is the best-preserved Roman arena in France. It was filled with medieval housing, when its walls served as ramparts, but they were cleared under Napoleon. It is still used as a bull fighting and concert arena. The Maison Carrée (Square House), a small Roman temple dedicated to sons of Agrippa was built c. 19 BC. It is one of the best-preserved Roman temples anywhere. Visitors can watch a short film about the history of Nîmes inside. The 18th-century Jardins de la Fontaine (Gardens of the Fountain) built around the Roman thermae ruins. The nearby Pont du Gard, also built by Agrippa, is a well-preserved aqueduct that used to carry water across the small Gardon river valley. The cathedral (dedicated to Saint Castor of Apt, a native of the city), occupying, it is believed, the site of the temple of Augustus, is partly Romanesque and partly Gothic in style. Nîmes secara tradisinya terkenal dengan tekstil. Denim, fabrik untuk seluar jeans biru, mendapat namanya daripada bandar ini (Serge de Nîmes). Sebuah jurnal matematik, Annales de Gergonne, telah diterbitkan dari Nîmes bermula pada tahun 1810 sehingga 1822 oleh Joseph Gergonne. Asteroid 51 Nemausa dinamakan bersempena dengan Nîmes, di mana ia ditemui pada tahun 1858. Dua kali setahun, Nîmes menganjurkan satu pertunjukan laga lembu utama di Perancis, Feria de Nîmes (perayaan), dan beberapa ratus ribu penonton akan berkumpul di jalanan. Pada tahun 2005, Rammstein memfilemkan album Völkerball di Nîmes, dan sekali lagi pada tahun 2017. Lapangan Terbang Nîmes-Alès-Camargue-Cévennes terdapat di bandar ini. Gare de Nîmes adalah pusat stesen keretapi, menawarkan sambungan ke Paris (rel berkelajuan tinggi), Marseille, Montpellier, Narbonne, Toulouse, Perpignan, Figueras di Sepanyol dan beberapa destinasi wilayah. Lebuhraya A9 menghubungkan Nîmes dengan Orange, Montpellier, Narbonne, dan Perpignan, A54 dengan Arles dan Salon-de-Provence. Terdapat rancangan untuk membina landasan berkelajuan tinggu TGV, Contournement Nîmes – Montpellier menghubungkan Nîmes dan Montpellier dengan LGV Méditerranée. Pasukan bolasepak Ligue 2, Nîmes Olympique berpangkalan di Nîmes. Pasukan ragbi tempatan adalah RC Nîmes. Terdapat juga pasukan bola tampar profesional juga terdapat di sini. Juara renang Sukan Olimpik, Yannick Agnel dilahirkan di Nîmes. Preston, United Kingdom, sejak tahun 1955. Verona, Itali, sejak tahun 1960. Braunschweig, Jerman, sejak tahun 1962. Prague, Republik Czech sejak tahun 1967. Frankfurt (Oder), Jerman sejak tahun 1976. Salamanca, Sepanyol, sejak tahun 1979. Rishon LeZion, Israel, sejak tahun 1986. Meknes, Morocco, sejak tahun 2005. ^ Frank Sear (1983). Roman Architecture. Cornell University Press. m/s. 213. ISBN 0-8014-9245-9. ^ Trudy Ring; Noelle Watson; Paul Schellinger (28 October 2013). Northern Europe: International Dictionary of Historic Places. Taylor & Francis. m/s. 853. ISBN 978-1-136-63951-7. ^ MobileReference (1 January 2007). Travel Barcelona, Spain for Smartphones and Mobile Devices - City Guide, Phrasebook, and Maps. MobileReference. m/s. 428. ISBN 978-1-60501-059-5. ^ Alain Veyrac, "Le symbolisme de l'as de Nîmes au crocodile" Archéologie et histoire romaine vol. 1 (1998) (on-line text). ^ The Ancient Languages of Europe - Woodard - Google Books. Books.google.co.uk. ^ Colin M. Kraay, "The Chronology of the coinage of Colonia Nemausus", Numismatic Chronicle 15 (1955), pp. 75-87. ^ Giving rise to the example of rime richissime Gall, amant de la Reine, alla (tour magnanime)/ Gallament de l'Arène a la Tour Magne, à Nîmes, or "Gall, lover opf the Queen, passed (magnanimous gesture), gallantly from the Arena to the Tour Magne at Nîmes". ^ "Railway Gazette: Southern LGV projects make progress". Dicapai 14 February 2011. ^ "British towns twinned with French towns". Archant Community Media Ltd. Dicapai 2013-07-11. Wikivoyage memiliki panduan pelancongan bagi Nîmes. Laman ini diubah buat kali terakhir pada 05:39, 2 Ogos 2018.